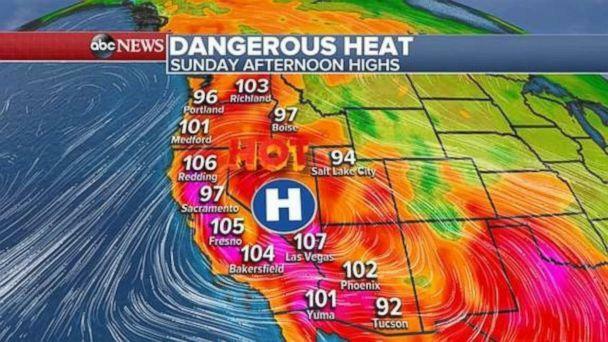 There are heat advisories, excessive heat warnings and watches issued for parts of the western U.S. on Sunday as the region continues to see above-average temperatures. 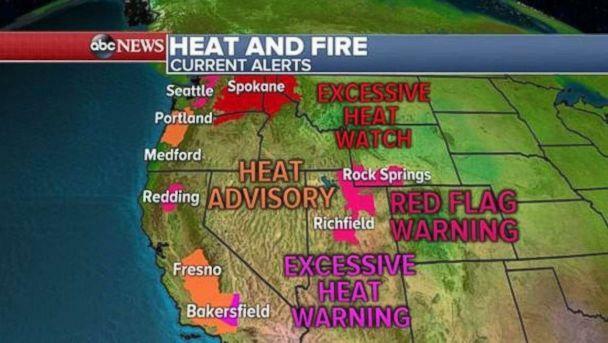 The heat is also expanding north over the next few days into parts of Washington, Idaho and Montana. Those alerts explain the 61 uncontained, large wildfires currently burning in 15 western states on Sunday. 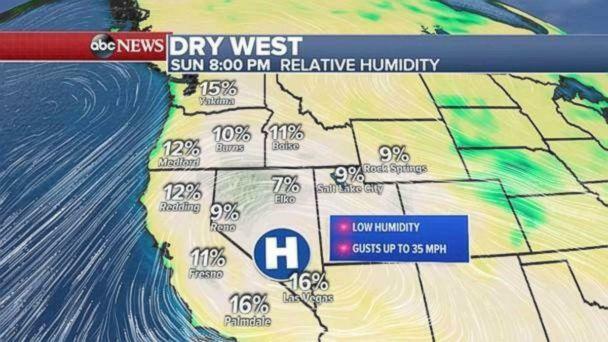 These fires are burning among very hot and dry conditions across parts of the West. The Carr Fire in Shasta County, California, is the most concerning, standing at 83,800 acres and just 5 percent contained. Five people have died in the fire, including two firefighters. 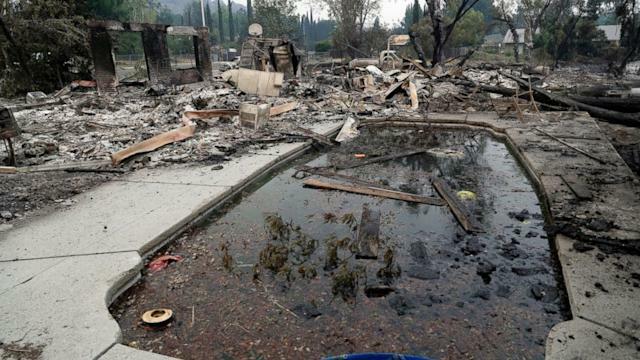 The Steele Fire, which broke out overnight in Napa County, California, has claimed eight homes and evacuations have been ordered. There are concerns for more fire growth due to dry, hot weather across much of California, parts of Washington, Wyoming and Utah. New red flag warnings have been issued for parts of these regions. Temperatures will soar close to, or even above, triple digits today across much of interior California and into parts of Oregon, Washington and Idaho. In addition to the warm temperatures, relative humidity values will bottom out in the single digits across parts of the region. There is no significant cool down in sight for much of this region. The heat will be most notable in the Northwest, where temperatures are locally 10 to 15 degrees above average. It is important to note, however, the average temperature in Redding, California, this time of the year is nearly 100 degrees. This is the hottest and driest time of the year for much of this region. Heavy rain, with rainfall rates of 2 inches per hour, is moving through parts of Kansas on Sunday morning. 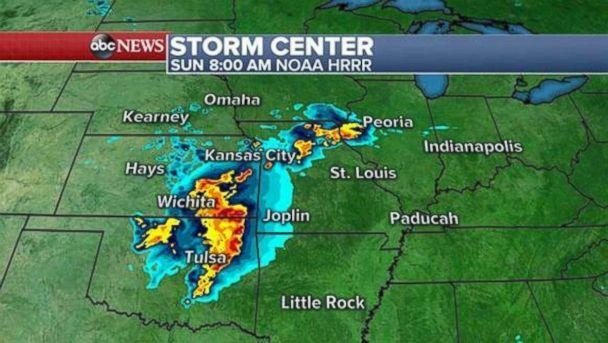 A severe thunderstorm watch has been issued until 9 a.m. local time for parts of Oklahoma and Kansas, including Wichita and Tulsa, due to a line of strong to severe thunderstorms. This line of storms will move east toward Missouri and Arkansas today, with locally strong winds and heavy rain likely. 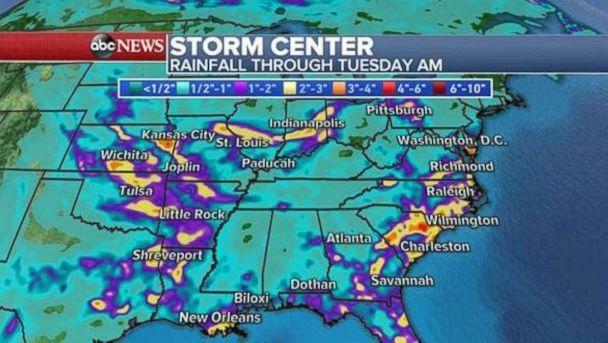 Locally, 1 to 2 inches of rain is possible today from northeast Texas to Illinois. Local flash flooding is a possibility. Another round of severe weather is possible Sunday across western Kansas, western Nebraska, eastern Colorado and southeast Wyoming. Damaging winds, large hail and brief tornadoes are the main threats. In the Southeast, numerous afternoon summer thunderstorm development is expected Sunday and Monday. The storms could have locally high intensity and localized flash flooding is possible from Florida to North Carolina.